THOMAS WILLIAM CORY was baptised 25 May 1832 at St George’s chapel in Deal, which served the seafaring community of the lower town. . The baptism was also entered in the register of the mother church of St Leonard’s, Deal, higher up. He was the child of Richard Cory and Ann Langley of Lower Street. His father was a gardener. In the 1841 census the family were still living in Lower Street. 9-year-old Thomas was the fifth of eight siblings still at home. The eldest boy had left. Although his father was a gardener and previously a publican, Thomas, like so many others in Deal, became a boatman. Thomas has not been found in the 1851 census. He was now 19 and like his older siblings had left home. 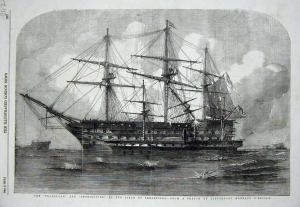 On 1 Nov 1851, we have the record of him joining HMS Trafalgar. Issued at HMS Trafalgar 1 day of Nov 1851. The date of birth given is a year out, but there is no other Thomas Cory born in Deal around that time, and the month is right. Their battle honours included Alma, Inkerman and Sebastopol. Following Nelson’s victory and death at the Battle of Trafalgar in 1805, HMS Trafalgar was the second ship to bear that name. She was a 120-gun ship of the line. She was launched by Nelson’s niece in 1841 with Queen Victoria in attendance. The initial cause of the war was Turkey’s rejection of Russian attempts to secure comparable rights with France over the protection of Christian religious sites and subjects in Ottoman-held Palestine. Russia also claimed other Ottoman-controlled territories and invaded the Balkans. Turkey declared war. When Russia went on to invade Bulgaria, Britain and France joined the war on Turkey’s side. The main operations of the Crimean War occurred around the Russian naval port of Sevastopol, which suffered heavy fighting and a long siege. A number of the Traflagar’s crew died en route to the Black Sea via Gibraltar, the Dardanelles, the Bosphorus, the Port of Sinope and Kalamita Bay. She was present at the siege of Sevastopol in 1854. In October and November, 100 marines were transferred to Balaclava, transports of cavalry arrived and other HM vessels joined the fleet. On 17 October at 12.50, firing commenced at Fort Constantine. ‘At one o’clock the allied fleets, whose large vessels had been slowly creeping up to the town in tow of steamers, opened fire upon the town, which from that moment became enveloped in a dense cloud of vapour’. The Trafalgar opened fire at 13.10 and ceased at 13.25, firing again at 17.26 for 13 minutes: She ‘ceased firing not being able to see the object on account of the smoke and darkness’. The harsh Crimean winter deeply affected the unprepared armies surrounding Sevastopol, and many troops fell victim to cholera and dysentery. In September 1855 the Russians finally abandoned Sevastopol to the allied forces of Britain, France, Turkey and Sardinia. Thomas returned to Deal, where he eventually owned his own lugger and became one of the outstanding seamen on the east Kent coast. The Deal Boatmen have a history both as smugglers and as lifesavers. They saved many lives when ships ran aground on the Goodwin Sands. There was no lifeboat at Deal until 1865. ELIZABETH ANN MAY. Elizabeth was the daughter of Sarah May. We have no information about her father, though her mother later married Edward Sacket. 1835 16 Jan Elizabeth Ann May illeg. daughter of Sarah. Alfred Square. Alfred Square marks the northern end of the “old town” of Deal. Her mother Sarah was from Deal. In successive censuses, Elizabeth says she was born in Ramsgate. It may be that Sarah went away for her pregnancy and returned to her home town for the christening. Or it may be that Elizabeth was mistaken. She may have been born in Deal and moved to Ramsgate while she was still too young to remember her previous home. Her half-brother was born and baptised in Ramsgate. Sometime between 1835 and 1843 Elizabeth’s mother married. We know that her new surname was Sackett. Her husband’s first name may be Edward, a tailor of Ramsgate, but this has not been confirmed. Elizabeth used the name Sackett for one of her own children, so it is possible that Sackett was her father. If he was a sailor, he could have been at sea when she was born, and married Sarah afterwards. But the fact that she was not living with the Sacketts in 1841 suggests that this was not the case. Elizabeth seems to have been brought up, for a time at least, by her mother’s family in Alfred Square. The baptismal register shows that Sarah May’s father was probably John May of Deal. The 1841 census does not give relationships, but we can assume that the older Elizabeth May was the younger one’s great-grandmother. Rebecca was probably her aunt and Thomas her uncle. The fact that 5-year-old Elizabeth’s name is given before Thomas’s and the rest of the children, suggests that Thomas and Harriet were not her parents. Elizabeth’s age is one year out. She was 6. But a grandfather or great-grandmother might have been vague about this, when her mother was not there to check. Sarah had probably left little Elizabeth behind when she left her parental home to marry Mr Sackett and start a new family. We only know of one child from this marriage. Elizabeth had a half-brother Edward Sackett, born in Ramsgate in the first quarter of 1843. Elizabeth became a dressmaker. We find her again in the 1851census. She is now living with her mother and half-brother. Dolphin Street runs from the northern end of Middle Street to the beach. Thomas and Elizabeth were married in Deal on 19 Oct 1857, only a year or so after Thomas’s return from the Crimea. The couple had nine children baptised at St Andrew’s, Deal. It is interesting that Elizabeth chose to give her daughter her mother’s married name, even though she was not herself a Sackett. The 1861 census shows this small family. 1861 Census. Deal. 2 Bridge Row. Then a son was born. Thomas junior died soon after. His death was registered in the first quarter of 1863. Four more sons followed before the next census. The family were moving house every few years. Bulwark Row was one street inland from the beach. 1871 Census. Deal. 7 Bulwark Row. Two more children were born, including a second Thomas. This Thomas too died in the first quarter of the following year. Thomas senior was famous for his work as a boatman in the Downs, the stretch of water where ships turned the corner from the English Channel towards the port of London. From E.C. Pain. The Last of Our Luggers and the Men Who Sailed Them. T.F. Pain & Sons. Deal & Sandwich. 1929. Deal was once celebrated for its hemp cable factories, but this was not during the period under review [1858-1909]. It was not until hovelling became practically a thing of the past that the Deal lugger disappeared…. The usual charge for carrying out an anchor in normal weather was £1 per cwt. (the value of the anchor), and from 10s to 15s per cwt for a cable…. The prizes for salvaging were rich – awards of £130 and £212 were typical of those made, which in the 1850s and 1860s were enormous sums. 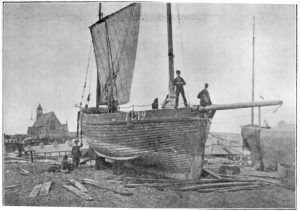 In those days all Deal and Walmer beach was full of those wonderful sea boats hauled up on the shingle, while their mizzen booms almost ran into the houses on the opposite side of the roadway. The Deal luggers are about 40 ft long and 13 ft beam, more or less. The small luggers are called ‘cats’. There is a forecastle or ‘forepeak’ in the luggers where you can comfortably sleep [weather and seasickness permitting]…. There is a moveable ‘caboose’ in the ‘cats’ right amidships, in which three or four men packed close side by side can lie. These large boats are lugger-rigged, carrying the foremast well forward, and sometimes, but very rarely,…. a mainmast also, with a maintopsail as well, of course, as the mizzen behind. The mainmast is now hardly ever used, being inconvenient for getting alongside shipping…. [The ‘Bath Chronicle’ reports] None enjoy being thoroughly idle more than those sailors, who know what hard work is, such as many of us would shudder to undertake. Pleasant moments have I spent with them in their reading-rooms, learning from them the ins and outs of their life, the tone of their conversation being unrestrained and jovial, yet never coarse; their good manners apparent by the way they admitted a stranger among them, being anxious to entertain him with their charts, their books or their papers, with a degree of unreserve yet respect that is seldom met with…. But times were often hard for the Deal Boatmen. 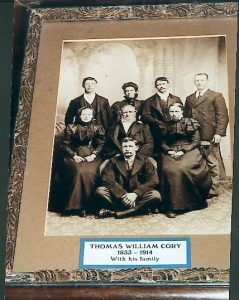 One of Thomas’s elder brothers, Morris Clayson Cory, emigrated to New Zealand in 1858. Two years later he drowned, when a party of Deal boatmen tried to rescue the crew of a schooner in a gale. Sarah has left home and is a servant to Sarah C. Mason, a widow Annuitant of 76, at 48 West St, Deal. In 1881Thomas William Cory was awarded £2.2s.6d by the Shipwrecked Mariners Association for the loss of the ‘Ellen’. Top Row (right to left). “The right hand figure is Grandfather who was born in 1864 Richard William who married Jane Bushell Baker and was a bricklayer. Edward (Ted) married Aunt Annie who lived next door in Middle Deal Road and he was a carpenter. Aunt Sally married a publican and had the Deal Hoy in Duke Street. Second Row. Aunt Polly [Mary] and she married a boatman. Great Grandfather Thomas William married Elizabeth Ann née May. Minnie [Harriet Annie] married a Royal Marine and as they had no children of their own, Ethel [Richard’s daughter] had a son before she died [of TB], who was illegitimate, so Minnie took the child over. It seems that Sarah and George took over the Deal Hoy pub from her uncle John Cory, who was the licensee in 1881. The Universal British Directory (1791) says of Deal: ‘A hoy which carries goods to London sails one week and returns the next.’ A ‘hoy’ was a coastal trading vessel used during the 17th and 18th centuries. On 4 Nov 1890 their son Morris married Elizabeth Harris at St Andrew’s Deal. The groom’s name was originally entered as ‘Morris’, a common name in this family, but this was crossed out and replaced with ‘Maurice’. The latter is how he signs the register. He was a soldier. Probably the recruiting officer wrote down his name with the more usual spelling, and Morris accepted it thereafter. In the same way my father Edmer Sampson became Edmar when he joined the Royal Marines and spelt it that way for the rest of his life. By the 1891 census, only one of Thomas and Elizabeth’s adult children was left at home. They were living in a 4-roomed house. 1891 Census. Deal. 78 High St.
England’s Glory was a South-end lugger, and is described in “The Longshoreman” as “the old lugger – by which familiar description we were in the habit of calling our favourite boat upon the beach; a stout, staunch sea-tub.” It was England’s Glory that launched at the same time as the Reform on the terrible night when the latter was driven on to the Pier and lost with eight hands. The author of “The Longshoreman” (Herbert Russell) shows an intimate knowledge of the sailing qualities of the Deal luggers. In choosing the Early Morn and England’s Glory as rivals in a race to the Goodwins on active service, he selected the two swiftest luggers on the beach in those days. If the former did not take the Borough Members’ prize – usually £10 – in Deal Regatta, it might almost be taken for granted that first honours would fall to the latter. The older type of craft represented by the Early Morn and England’s Glory were unsurpassed, in point of sailing qualities, by boats of more recent design. This was to some extent accounted for by the fact that the newer boats were built with a view to fishing as well as hovelling, to say nothing of the advantages of speed to the earlier craft, when it came to smuggling. 8 Jul 1898 Thomas William George CORY age 18mths of Deal. Elizabeth Ann Cory died in 1894, at the age of 59. Thomas cannot be found in the 1901 census. His son Richard and his family are also missing. It may be that Thomas had moved in with them, or that one or more enumerator’s books is missing. In the 1911 census, he was living alone in the almshouses in Beach Street. He was receiving a pension for his services in the Navy. Thomas William Cory died on the 3rd March 1914. The East Kent Mercury records that he was buried with full military honours in acknowledgement of his service in the Crimean War. FUNERAL OF MR THOMAS CORY. – The funeral of Mr Thomas Cory – the Crimean veteran and naval pensioner, whose death was announced in our last week’s issue – took place in Deal cemetery on Saturday afternoon. The deceased mariner was accorded a naval funeral, the remains being carried to their last resting-place on a gun carriage, drawn by a party of Marines, some 25 in number. Among the mourners was Mr William Hookham (formerly Master of the Dover Trinity Pilot Cutter), an old shipmate of the deceased’s, while the Rev P Lawson Neagus (Downs Chaplain, Missions to Seamen), officiated at the graveside. As the Marine bugler sounded “The Last Post”, a touching incident occurred outside the cemetery gates. At the time a troop of Baden Powell Girl Guides in uniform, under the command of Lieut. Miss Ena Russell, were returning from a scouting expedition, when, hearing the bugle, and instinctively guessing its meaning, Miss Russell immediately brought her little company to a halt, and at the word of command, the Girl Guides formed up outside the cemetery, stood at “attention”, and remained at the “salute” until the last sad note had died away. His grandson William Thomas Cory, son of William Henry Worthington Cory, applied to join the army in the same year. Merchant Navy Seamen 1835-1941. Findmypast.